As LeBron James embarks on his ninth Eastern Conference finals since 2007, we look back at a pair of his most legendary road contests. 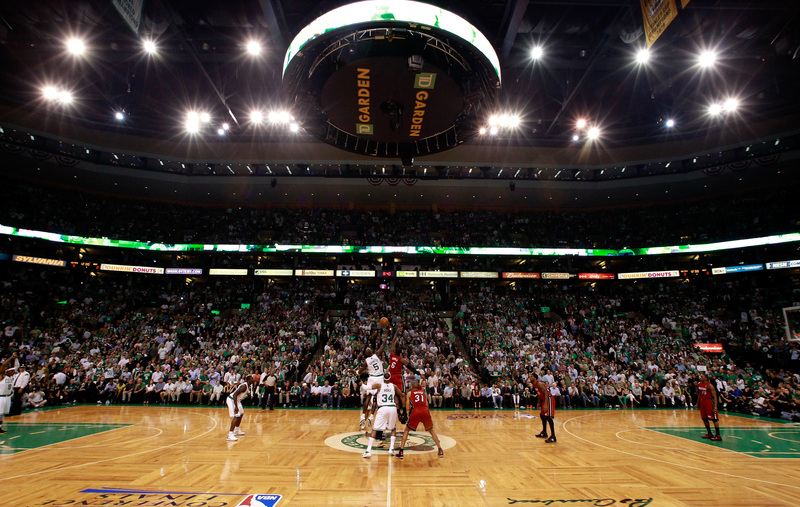 This, the second of a two-part series (part one is here) travels back to Game 6 of the 2012 Eastern Conference finals, when James’ Miami Heat squared off against his longtime rivals, the Boston Celtics. James recently revealed his affinity for playing road playoff games: Adversity is his basketball aphrodisiac. LeBron James, the reigning NBA MVP, sat at the brink of infamy. It was June 7, 2012. He sat in the visitors’ locker room at TD Garden, in all likelihood reading Suzanne Collins’ 2010 Mockingjay — the final installment of the Hunger Games series. Then he got stretched by Miami Heat trainers. Evening was turning to night. It was time for Game 6 of the Eastern Conference finals, and the sports world was closing in on James. No athlete had ever been under as much pressure to win a championship, let alone a single game. Despite 30 points and 13 rebounds, James failed to a make dent in the final minutes of Game 5. Scoring a single bucket in the final 8:12, critics emerged in full force. Like The Notorious B.I.G. rapped 15 years before in “My Downfall,” the world tweeted for and celebrated LeBron’s. In real life, though, everyone with an opinion had an opinion on ’Bron in the hours that lead up to Game 6. The chatter went as follows: He stood on the edge of the worst professional embarrassment in the modern sports era. He lathered in the star power that came with “King James,” the most recognizable nickname in sports. He lacked the “killer instinct” of Michael Jordan and Kobe Bryant. How could LeBron be the best player in the world without a portfolio to match? This wasn’t how the Miami Heat experiment was supposed to unfold. It wasn’t supposed to conclude, Year One, with a soul-crushing defeat at the hands of Dirk Nowitzki and the Dallas Mavericks. In 2011, his second career Finals, James put up only eight points in Game 4 and struggled to body the Mavs’ J.J. Barea, a guy, in comparison, the size of a ventriloquist’s dummy. Even LeBron’s marketing potential was said to be in hospice. And Year Two damn sure wasn’t supposed to end under virtually the same circumstances as it had in 2010, during his first Cleveland stint. There had been an image-tainting Game 5 home loss. This was followed by a series-ending and NBA landscape-changing Game 6 loss in TD Garden to Pierce, Kevin Garnett, Ray Allen, Rajon Rondo, coach Doc Rivers and the Celtics. Between basketball immortality and basketball infamy — that’s where LeBron James found himself one early summer night in 2012 Boston. It’s easy to minimize now, but back then, outside of Miami, much of the basketball world truly wished for James’ demise. Billed as professional basketball’s next Jordan, he’d failed to deliver the Larry O’Brien Trophy to Northeast Ohio or to South Beach. The Heat had supposedly ruined basketball, and LeBron James was the ringleader. The “Big Three” — James, Dwyane Wade and Chris Bosh — had probated before they pledged. Ran the yard before getting in the cut. ’Bron’s 2010 edict, “not two, not three, not four, not five” championships, was a constant gnat by his ear, but by the evening of June 7, 2012, what had been an irritating buzz turned into a deafening roar. Before taking the court, Fizdale pulled aside Wade, James’ best friend. If anyone knew what was going on inside LeBron’s head, it was Wade. “How we doing?” Fizdale asked. That’s what play-by-play commentator Mike Breen said minutes before tipoff of Game 6, as nearly 19,000 fans raged around him. They packed Boston’s TD Garden, ready for a two-part party. First, fans were amped to celebrate the Celtics’ third Finals trip since 2008. Secondly, they were up for ending LeBron’s championship dreams, on their home floor, for the third time since 2008 as well. Kevin Garnett (No. 5) of the Boston Celtics fights for the opening tip against LeBron James (No. 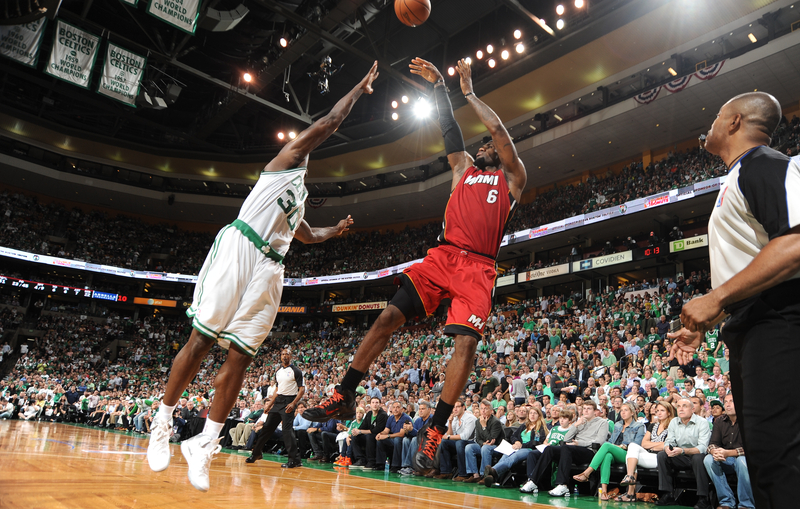 6) of the Miami Heat in Game 6 of the Eastern Conference finals on June 7, 2012, at TD Garden in Boston. After his conversation with Wade, as Fizdale and veteran forward Juwan Howard walked to the bench, they both knew something historic was in the works. They just hoped they were on the right side of history. James’ patented smile didn’t make the trip to Boston. In an instant that has since been immortalized in basketball culture, James bent over and grabbed his shorts — and the look in his eyes was the most infernal of his career. He looked as if his life had been threatened, like if this was the last anyone would see him, he’d go down emptying every clip in his possession. “That was his moment of, ‘Yeah, I’m the greatest player in this league and I’m not letting anybody get in my way of a title.’ We just knew right then,” Fizdale says. “I don’t know what you would call it, but he just went inside himself. … ’Bron was just as calm as I’ve ever seen him.” Long ridiculed for supposedly lacking a closer’s mentality, no one had ever seen such an expression on his face. James tasted blood, perhaps his own. Game 6 was deeply personal. His name was his name. LeBron James’ game was undeniable, in a rare class of dominance. He wouldn’t leave Boston until the city crumbled in ruins. James deployed a diverse menu of buckets. Tomahawk dunks running downhill. Fadeaway jumpers over Pierce. Baseline jumpers over Ray Allen and Mickael Pietrus. Fast-break and-1s carrying Greg Stiemsma with him, and floaters over Garnett and Pierce. There were jab steps on Pietrus, 3s with Stiemsma’s and Pietrus’ hands in his grill and turnaround baseline jumpers over Rondo. James was Marlo Stanfield with a basketball. Every Celtic defender was a body left in a vacant building. James did it all without a smile, or anything else that would suggest he had a conscience that night. The Celtics couldn’t stop the bleeding — it started the moment James zipped a pass to Mario Chalmers in the first quarter for a 3 to give the Heat a 3-2 lead. Because after that, James opened another wound. And another. He finished with 45 points, 15 rebounds and 5 assists, shooting 19-of-26 against Boston’s notoriously stingy defense (second in points per game allowed in 2011-12). James joined Wilt Chamberlain as the only players in history to post a playoff line with similar numbers. In the playoff battles since, James’ chase-down block of Andre Iguodala in Game 7 of the 2016 Finals is immortalized as his career’s defining play, and Games 5-7 of that series are touted as his most glowing stretch. LeBron James of the Miami Heat shoots the ball over Brandon Bass of the Boston Celtics in Game 6 of the Eastern Conference finals on June 7, 2012, at TD Garden in Boston. But with a career seemingly defined by asinine pressure and outlandish expectations, the spotlight on James has never been brighter than it was for that Game 6 against Boston. In the biggest contest of his career, with everything on the line, not only did LeBron James survive, he delivered his magnum opus. And James’ disposition barely shifted when the game ended. He was still in go mode. “He was Leonidas-like, when the guys in 300 won their first battle,” Fizdale recalls. “Everybody is celebrating, and Leonidas is just standing there like, ‘Nah, we’ve still got work to do.’ ” James wouldn’t allow himself, or his teammates, to relax with Game 7 on the horizon. It paid off: The Heat won Game 7, with Wade scoring 23 points and Bosh coming off the bench for 19. James finished with 31 points and 12 rebounds, playing the entire game sans 28 seconds. Weeks later, the Heat and, in particular, James found the championship they desperately sought by defeating a young Oklahoma City Thunder squad led by its own three-headed monster of Kevin Durant, Russell Westbrook and James Harden. As for Fizdale, he’s one of the league’s hottest and most popular coaches, with catchphrases worthy of a part-time WWE gig. James, of course, is in his ninth conference finals since 2007. He’s in hot pursuit of a fourth championship and the label of Greatest Of All Time. His peers, like Paul Pierce, and his predecessors admit this is a very relevant conversation. James and Fizdale remain the kind of close friends who lived through the trauma of being league pariahs — and the satisfaction of turning into the NBA’s biggest rock stars. Coach Fiz can’t name a performance by anyone comparable to LeBron’s Game 6 gem.